When I gave birth to my first child, my dad gave me a brochure and an envelope. The envelope contained money and the booklet contained information about RESPs. I was happy with the money (I did not expect that this little angel required so many things: diapers, clothes, crib, etc.). I was not interested in the information about RESPs. After all, my child was only a few days old and we had all the time we wanted to plan for his education. It can wait, I thought! My dad had a different opinion and asked (or should I say ordered) that I spend that money on opening an RESP savings account for my baby. I was not very happy. I was an adult and I can make my own financial decisions for myself and my baby. I did not count on my dad’s persuasion and patience to convince me to open an RESP. It took him some time, but he managed to do so eventually. Hopefully, I will convince you too and not within months but TODAY! It is so important to start saving for your child’s education as soon as possible. They grow up so fast and you shouldn’t waste that precious time like I did. You will regret it. But first what is an RESP? Now the question: How do I start saving in an RESP? Are you already saving in an RESP? Share your tips for saving more money for your child’s education below! RESP stands for Registered Education Savings Plan. It is available to Canadian families to help them save for their child’s post-secondary education. This is probably not news to you, but did you know that post-secondary education is not free? It is not cheap either. Besides the registration and annual fees, you may have to pay for housing, textbooks, clothes, etc. Of course, your child can help by taking a job, but it won’t be enough to pay for all the expenses. Besides, I don’t want my child to work too much or burden himself with student loans. I want him to concentrate on his studies. 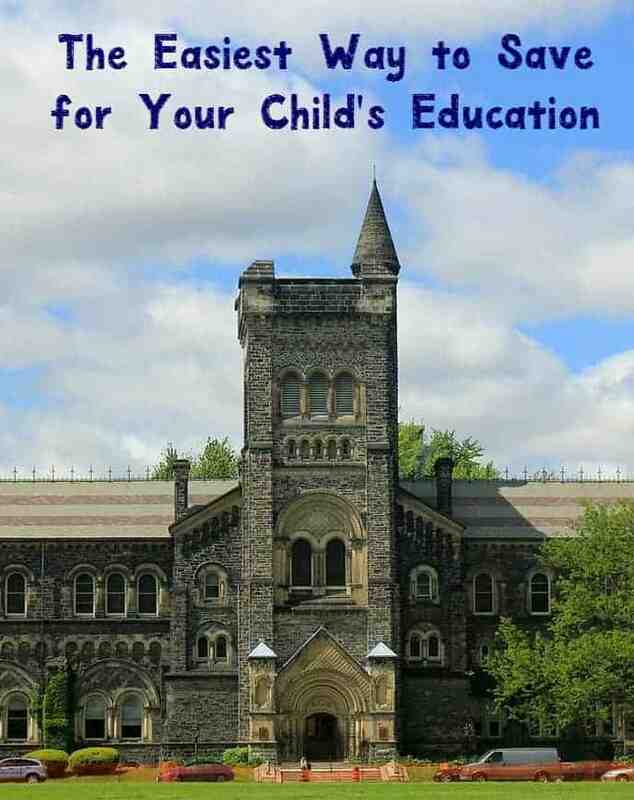 In order to help you save for your child’s education, the Canadian Government set up an RESP program. The account beneficiary (your child) is eligible to receive government grants. Don’t we love all those grants? The Government of Canada contributes 20% of the first $2,500 in annual contributions. Isn’t that the best return on investment ever? 20% is huge! Besides, the interest made on those savings are tax-free (while it is in this account). I am in love with this program. You can get the most out of your RESP by saving the maximum amount eligible for the government grants which become available to your child starting the year they are born. The good news is these grants are carried forward each year if they are not used, so if you find it difficult to make a contribution or maximize your contribution in some years, you can make up for it by increasing contributions in the following years to receive grant from previous years. Easy, right? Bear in mind that there is a lifetime RESP contribution limit of $50,000 per child. You need help and professionalism in this matter. You need a trusted organization that will open this registered account. An organization that will maximize your annual return besides the government grants. You need Children’s Education Funds Inc! It has the PTPA seal of approval. I feel confident when I see that seal. It means that this organization is trustworthy. After all, I will be depositing my hard saved money. In 2014, they paid $68,000,000+ to Canadian Families. And because I love bonuses, if you open a new CET Plan in 2016, you will receive 25 Air Miles® reward miles in celebration of Children’s Education Funds Inc.’s 25th Anniversary. So why wait? Don’t waste time and money – contact CEFI today online or by calling 1 (800) 246-1203 and book a consultation. The clock is ticking! While visiting the site be sure to enter the CEFI promotion to win an additional 10,000 Air Miles and the contest to win a Disneyworld vacation. Although this post has been generously sponsored by The Children’s Education Fund Inc., the opinions and language are my own. What a great way to save money for your child’s education. I wish they had something like that in the states. I’m always looking for ways to prepare for the future. Thanks for the additional ideas. We put away money for all four of ours. Three through a state program (Florida PrePaid) and one on our own (since my youngest was born in another state). It was the smartest thing we did. I didn’t ask my parents for money for my education. I’ll be paying loans until I’m a grandmother. I like the idea of saving now so I have something I could offer my littles when the head to college. I can’t think of anything more important to invest in than our children. You can never start too early to prepare a great start for their life. Programs like this are a benefit for parents and kids. A good education is priceless – and it seems the colleges, universities, and specialized programs are out to make it that way. Saving and getting a bonus for doing so is a fantastic incentive. It’s a great idea to start saving early. I was just listening to a radio program about the rising cost of a college education and the expected total for a four year degree to soon be $300,000! We adopted our daughters when they were 9 and 12 which didn’t give us much time to put money away for college. I had no idea how expensive college actually was. My daughter just decided on a school that is $40,000+ a year. I have no idea how she’s planning on paying for all that, but I encourage parents of younger kids to start saving now!!! I wish we had started saving for our kids sooner. I want them to get the best education possible. I highly recommend parents start saving for their children ‘so education as soon as possible. I agree. Start saving as early as possible. My daughter is heading to college in 2 years, and I don’t feel we’ve saved as much as we could have since we started so late. This sounds like a great way to save for your kids education. It is so important to start saving as early as you can. School is so expensive. We have had college funds for our children since they were born, but these additional benefits would be great. I need to see if we have anything similar here in the US. We’ve had accounts for our kids since we found out we were expecting with each of them but recently we want to look into RESP’s they are such a good idea, and this is so important. It’s so important to start thinking about these things early. A RESP fund sounds like a great option for parents to consider for their child’s education. These types of plans are so important if you want to make college an easier option for the kids. We a few different things like this in the states. In NY it is a 529 plan. We have made regular contributions since our son was one. When you give a little, and regularly, it adds up. I want my son to have more choices than I did, I am so happy I can help this way! RESP sounds like a great program. Saving for college early is so important. My mother in-law started a saving account for my son before he was born. This is great to know. Saving can be tough! I’ll need to look into this for my boys. It’s smart thinking to get that funding started early. They grow up before you know it, and ‘later’ gets here a lot sooner than you think. Great post and tips. Shared and thanks for sharing. We have a small account for our kids. We really need to step up and do more with it so it will grow. I’m sure college will be ridiculous when they’re ready to start. This is such a great post to remind all parents that we also need to give those kids some education, It is really important. We’ve had accounts for our kiddos since I POAS. It’s great, and really helps. I need to look into RESP’S! I adore their purpose and think they are helpful. I didn’t plan well for my children’s college education. Now, I am obnoxiously insistent that my children plan from the beginning for their children’s education. Thanks for the information. You can never start too early. I lived during the time where college was about $150 per semester but not too long after that my small college turned university and the price went into the thousands. I don’t know how kids do it today. I’m glad to see there are ways to pay for college. Saving money while they still young is really important. This is really great option for kids for their education and future. I am hearing about RESP for the first time, but may be my sister could have known it as she lives in Canada. I love that it helps in saving for your children’s education in the future which is really a great stuff. 20% really is huge. I can see why you are in love with the account! Great idea for kids education. Thanks for sharing these tips. Really useful! My children were all so close in age that I admit, I did not even begin to think about college until the last of their high school years. I wish I would have planned ahead. Great information! I know right. College is super expensive nowadays too! I’m in a little bit of sticker shock seeing how much college costs. It’s going to be a crazy decade putting the three kids through college! Sounds like a good idea, I love this information I will save money for the future of my kids especially for their college days. This sounds like an awesome investment for not just yourself for the future but your children’s future! It is so important to save for their futures! A goal as a parent is to have your children succeed and this is definitely one way of doing that! It is really important to know saving for their education. I’m just teaching my kids about that. This is really a great idea. We all should think about children’s future and education. Everyone should start saving money, not only the parents but also to those people who’s planning to have a family. It’s better to be advance now. This sounds like a great option. It’s nice to build up savings to help the kids pay for their educations. That sounds really nice, I just wish everyone has that not just Canada, it will definitely help a lot of people especially when it comes to finishing their education. Thanks for all the info! College is so expensive these days that you really do have to start saving as soon as your kids are born. The sooner you start the better. It is so important to set aside money for our childrens’ education. If you don’t start early, it can be really difficult later on. I have never heard of this before, I have not saved a dime for kids at all, which is bad considering my oldest is heading into high school this coming school year. I feel so unprepared! We have started saving for our kids!! With three kids we could have quite the education bill, this is great information! We have a small account for our kids. But the time is running out so I really need to get going! I’ll admit that we have not been saving for our boys college expenses. Sometimes it seems so out of reach when living on a single income. However, it is great that there are options for saving.